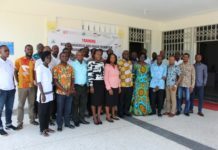 The Atwima Mponua Rural Bank Limited at Toase in the Atwima Nwabiagya district of Ashanti Region has posted an impressive operational performance in the 2017 year under the review. 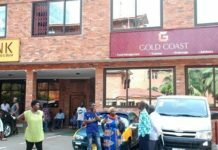 The bank has recorded a pre-tax profit of approximately GH¢1.88million as against a little over GH¢1.38million – representing a percentage growth of 35.4 over the previous year. The bank recorded total deposits of about GH¢47million in the 2017 year under review as against the previous year at a little over GH¢38.6million, representing a satisfactory growth of 21.63%. The Chairman of the Board of Directors, Mr. John Swanzy, announced these and more at the bank’s 34th Annual General Shareholders’ meeting held last Friday. According to him, the Ghanaian economy showed an improvement after some fiscal slippages in 2016. Inflation was 11.8% at the end of December 2017 compared to 15.4% in December 2016. The performance in the banking industry of Ghana was resilient during 2017. The industry’s high Non-Performing Loans (NPL) level remained the major driver behind high lending rates and the industry’s restricted credit stance. The Bank of Ghana in order to strengthen the financial sector development and foster economic growth, increased the minimum operating capital for universal banks from GH¢120million to GH¢400million by 31st December 2018; RCBs’ capitalisation was moved from GH¢500,000 to GH¢1million by December 2016. Despite the challenging macroeconomic and political environment that pertained during the reviewed year, the bank managed to pull an impressive operational performance for almost all the financial indicators in the 2017 year under review, as shown in the table below. The directors have proposed a dividend payment of GH¢0.025 per share for the year under review. The proposed dividend payable for 2017 financial year is GH¢338,489.25; this represents a favourable increase in dividend payout of GH¢69,447 or 25.18% over 2016. The bank continued to offer assistance to communities and institutions within its operational territories in terms of community development projects. A total amount of GH¢207,887 was spent in this direction and as part of the bank’s corporate social responsibility. Areas that benefitted included education, District Farmers’ Day celebration, donation toward national projects, among others. The bank spent GH¢196,967 on the Toase M/A Basic School project alone in the year under review. 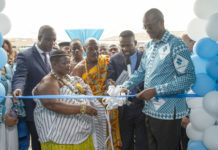 The bank in 2010 embarked on a journey toward supporting the Toase M/A Basic School with a six (6) classroom block under the initiative of the late Toasehene, Hon. Captain Nana Asiama Poku Afrifa ll. The Board Chairman informed shareholders of the completion and fulfillment of their pledge, and has handed over the project to the Ghana Education Service through Nananom of Toase Stool land at a brief presentation ceremony during the meeting. Atwima Mponua Rural Bank was recognised by the Ghana Investment Promotion Council under the Ghana Club 100 in the last edition as one of the best 100 performing companies in Ghana, ranking 66th on the list. The directors therefore hope to continue working hard to improve upon the bank’s achievements in future. Despite the challenges in 2017, the board and management hope to explore other opportunities for business growth by intensifying deposit mobilisation through quality services and outreach programmes to enhance the bank’s performance. The Managing Director of ARB Apex Bank, Mr. Kojo Mattah – whose address was delivered by Mr George K. Annor the Ashanti Regional Branch Manager, commended the bank for maintaining the ‘satisfactory’ category of the Efficiency Monitoring Unit report of ARB Apex Bank in its performance rating since September 2015. This, according to the MD, is refleced in all assessment parameters including capital, asset quality, profitability and liquidity. 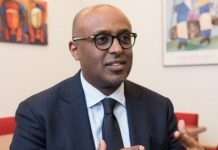 He further urged the board to continue with the strategic direction it has set for the bank, and ensure that it becomes stronger in the years ahead for the benefit of all stakeholders. The Board Chairman in his concluding remarks on behalf of the Board expressed his appreciation to management and staff of the bank for their contribution to the successful results achieved all these years.